Nitric acid is a very strong acid that has the potential to cause very serious burns through its corrosive action. Nitric Acid Poisoning is the accidental or intentional intake of nitric acid, or any product containing the compound. The exposure may be through skin/eye contact, or following ingestion of the chemical. What is Nitric Acid Poisoning? The acid is used in the manufacture of rocket propellants, fertilizers, textiles, lab reagents, plastics, industrial catalysts, cleaning and etching agents, etc. What are the Causes of Nitric Acid Poisoning? What are the Signs and Symptoms of Nitric Acid Poisoning? How is First Aid administered for Nitric Acid Poisoning? Who should administer First Aid for Nitric Acid Poisoning? 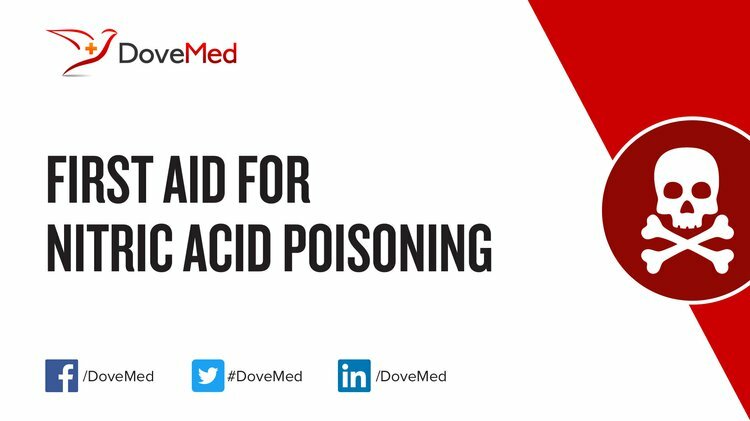 First aid for Nitric Acid Poisoning is administered by healthcare professionals. What is the Prognosis of Nitric Acid Poisoning? How can Nitric Acid Poisoning be Prevented? Milton, R., Mathieu, L., Hall, A. H., & Maibach, H. I. (2010). Chemical assault and skin/eye burns: two representative cases, report from the Acid Survivors Foundation, and literature review. Burns, 36(6), 924-932. Palao, R., Monge, I., Ruiz, M., & Barret, J. P. (2010). Chemical burns: pathophysiology and treatment. Burns, 36(3), 295-304. Karunadasa, K. P., Perera, C., Kanagaratnum, V., Wijerathne, U. P., Samarasingha, I., & Kannangara, C. K. (2010). Burns due to acid assaults in Sri Lanka. Journal of Burn Care & Research, 31(5), 781-785. Zhang, Y. H., Han, C. M., Chen, G. X., Chun, J. Y., Jiang, R. M., Liu, L. P., & Ni, L. F. (2011). Factors associated with chemical burns in Zhejiang province, China: an epidemiological study. BMC public health, 11(1), 746. Jensen, P., Thyssen, J. P., Johansen, J. D., Skare, L., Menné, T., & Lidén, C. (2011). Occupational hand eczema caused by nickel and evaluated by quantitative exposure assessment. Contact dermatitis, 64(1), 32-36. Li, W., Wu, X., & Gao, C. (2013). Ten-year epidemiological study of chemical burns in Jinshan, Shanghai, PR China. Burns, 39(7), 1468-1473. Armour, M. A. (2016). Hazardous laboratory chemicals disposal guide. CRC press. Ananthakrishnan, N., Parthasarathy, G., & Kate, V. (2010). Acute corrosive injuries of the stomach: a single unit experience of thirty years. ISRN gastroenterology, 2011.